Pacific lamprey, captured in rotary screw trap on Sacramento River at Knight's Landing. Photo by Dan Worth, California Department of Fish and Game. 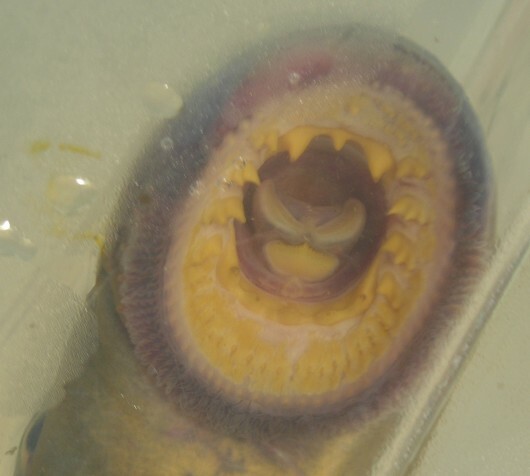 Pacific lamprey (mouth), captured in rotary screw trap on Sacramento River at Knight's Landing. Photo by Robert Vincik, California Department of Fish and Game. Pacific lamprey juvenile (albino), captured in rotary screw trap on Sacramento River at Knight's Landing. Photo by Robert Vincik, California Department of Fish and Game. Pacific Lampreys are usually anadromous with two very distinct parts of their life cycle, though some landlocked forms of lamprey exist. Pacific Lampreys begin their life cycle as an ammocoete or larvae, usually within a freshwater stream. Ammocoetes burrow tail first into mud or soft substrate where they filter feed on algae and organic matter. The larval lampreys often move around the stream in their 5-7 year stay in freshwater. When the ammocoetes reach a length of around 14-16 cm TL they begin a drastic change in physiology and physical appearance. 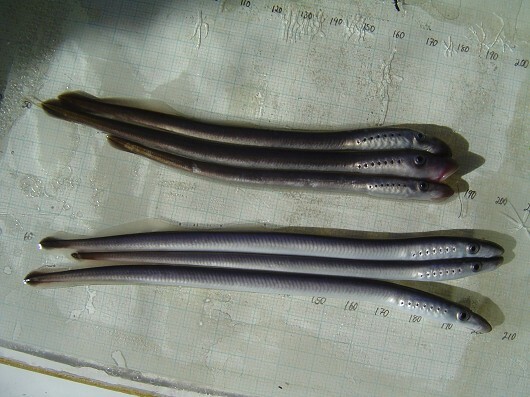 The larval lampreys take on a silvery form with large eyes and a sucking disc. The newly morphed lampreys swim downstream to the Pacific Ocean where they take on a new predatory lifestyle in an estuarine or saltwater environment. Lampreys rarely stray far from the mouth of their home stream. Pacific Lampreys attack and feed on fish including salmon and flatfish. The stay at sea usually lasts 3-4 years in Canada but may be shortened in more southern populations. Like salmon, the lampreys return to freshwater and migrate upstream to spawn and die. Most upstream movement occurs during the night under high flow conditions, and some streams have different runs of lampreys. Runs may be different in the timing of entry to freshwater or in the amount of time spent in freshwater before breeding occurs. Breeding males and females dig a nest in moderately swift water by removing rock and gravel from the stream floor. A female will attach herself to a rock upstream of the nest, and the male will attach himself to the female or to a nearby anchor. The female releases 20,000 to 200,000 eggs in total, and the male releases his milt. The nest is then covered by stirring the substrate upstream of the fertilized eggs. Often one female will have her eggs fertilized by multiple males, as individual nests may be constructed in close proximity to others. Usually the male and female then die, though studies have shown that some adult lampreys live to spawn again the following year. The embryos hatch after roughly 19 days, and the resulting ammocoetes often stay within the safety of the gravel substrate before venturing into the current.